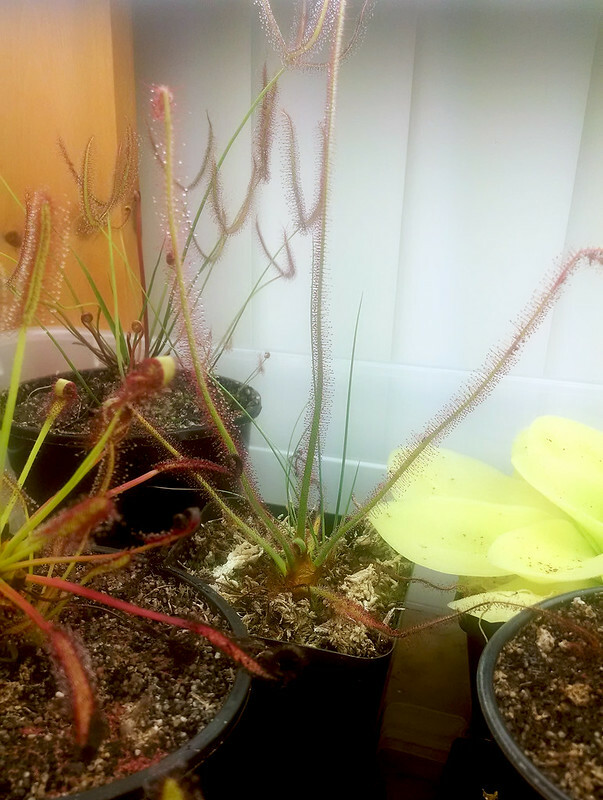 Happenings around the collection |Sundews Etc. Remember those Drosera 'Marston Dragon' flower stalk cuttings? The ones that totally went kaput and did nothing? 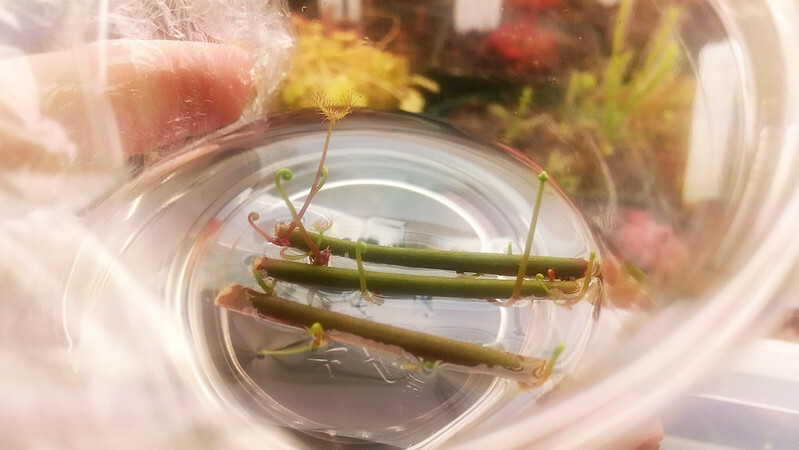 As I mentioned, I also started some cuttings from the same flower stalk in water, and they've recently totally exploded. Little plantlets exploding out of the flower stalks. Look at the cute little leaves! I'm hoping that since they've reached this point they'll be less likely to involute and die when transferred to the media (which is what happened to the D. 'Marston Dragon' leaf cuttings I did earlier). As soon as I get a day off with enough time to mess with my plants that's high on the agenda. 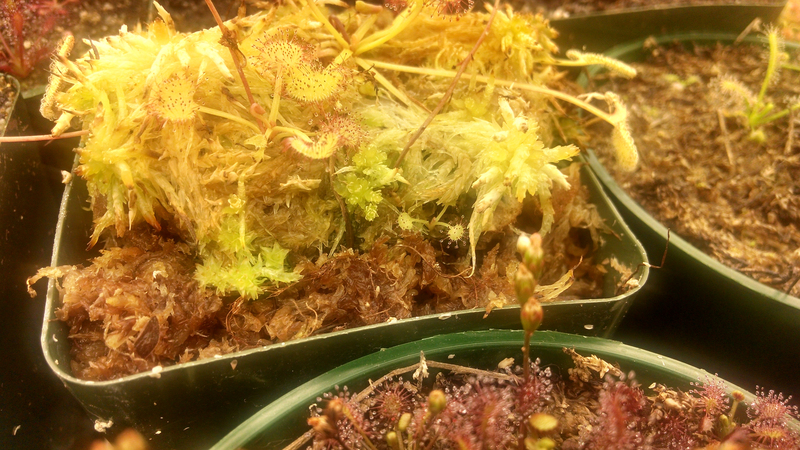 In other vaguely propagation-related news, the Drosera allantostigma that I got from Brie during the NASC auction are starting to bloom. How cute! Drosera allantostigma is absolutely one of my favorite species. Look how beautiful. Looks like a couple of the Drosera pygmaea next door aren't doing so hot. Well, several are still going strong at least. 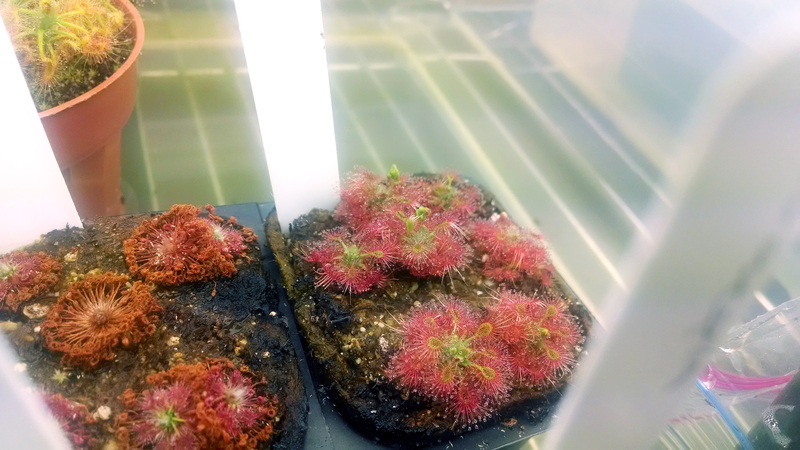 There's also some new action on my Drosera prolifera. This D. prolifera seems to be...proliferating. Sorry about the horrifyingly yellow picture, but look right in the middle. A little baby! It looks like this guy is settling in nicely. 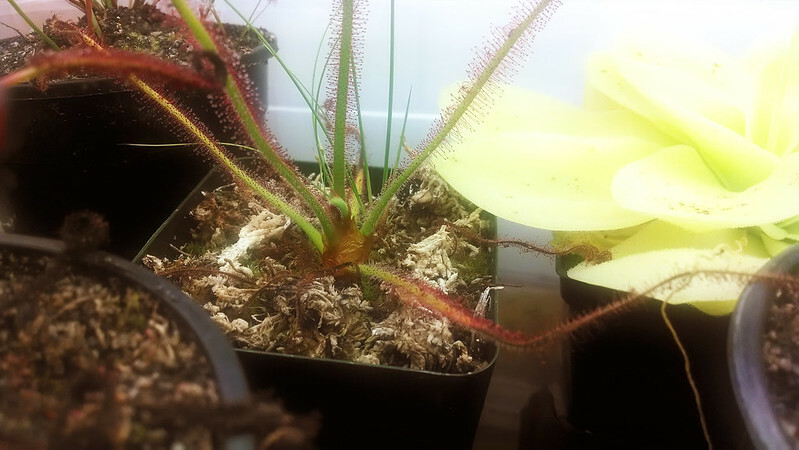 Since this is a sort of all-around update, I wanted to take the time to brag about my Drosera spiralis. My D. spiralis is getting so tall. I couldn't capture it in its entirety (I need to put together some sort of black background for photographing my carnivores) but it's growing really well. That tallest leaf is almost 8 inches (20 cm) long, and is well-dewed and healthy looking. I've had the plant for six months now, and it seems to tolerate the occasional hot day really well. I love having it in my collection. I hope it continues to do well! This plant is a special project of mine. Still pushing out new growth too! It only supports 4 leaves or so at a time, so each new one is a big deal. Is anything exciting happening in your collection?